While you are reading this latest newsletter I will be on my holiday. I am keeping my fingers crossed for some good weather and, as most of us UKers know, the weather in our part of the world cannot be relied upon, and we are staying in the UK this time. But I am looking forward to the break anyway. If you send things into the website ...emails, stories, photos, then I hope you won't be too upset not to get my usual quick response. I won't have access to my PC until I get back and so won't be able to deal with any submissions that I get. But I promise they will get my undivided attention on my return. And while I am on the subject of submissions I would like to tell you what I have been doing for the last few weeks. The "Gallery Page" was getting so long for visitors to scroll through that I decided to tidy it up. 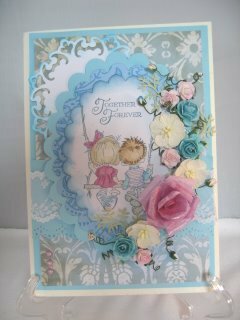 It's length was due to all the lovely cards that you have all been adding to that section. So to make it easier to access, and to give you all the credit you deserve, this is what I have done to tidy up the pages. If you have sent in one page of photographs (and you can add four photos to any one page) then you will see it, with the title you gave it, in the Gallery. But if you have sent in more than one page then I have added all your beautiful creations to one section and added your name to that section. Each of the pages you have added will still have the title that you gave it but the section will be labelled with your name. So that way you will be able to view all the cards and ideas from that one person. It gives the credit to you ... the lovely people who make these fabulous designs .... and lets everybody else see the work you are proud of. Take a look and see the result in the Gallery. So please continue to add your name to your work as you have been doing in the past. If you change it then please let me know so that any future submissions will go onto your page and not someone elses. But of course they add a lot of height to your cards, which makes it impossible to get into an envelope. 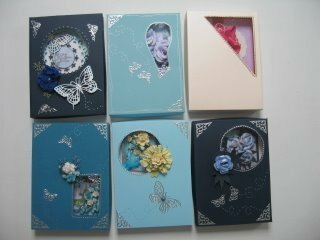 So I have added a New Tutorial to show you how to get just the thing for your "Special Cards" and that is ... Making Boxes. It takes you step by step through the stages and will give you professional results everytime. 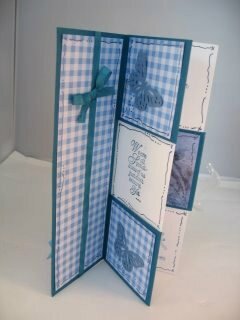 Practise on some cheap card first and then when you feel confident you can start on your good stuff. Butterflies are very in vogue at the moment and last month we made the Paper Folded Butterfly as a way to use up scraps of your favourite papers. This month I have added another one that you may like to try. 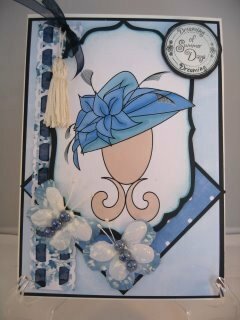 Making Butterflies will use up those extra flower petals that you may have left over from other projects. Or perhaps they were on offer cheaply in your local craft shop. I got a big box full for £2 from my local store. But it is very effective and easy to do and I hope you will give it a try. This may be another card to make a box for. Secret Panel Cards This is new card fold for the "Kinetic Cards" section and is one that can hide any message that you may want to send. The card has many titles around the world and I have heard it referred to as the "Jacobs Ladder Card"